The Chinese in Kelantan had a long historical link with Kelantan. It was reported that it traced back to 1429(24 years after Admiral Zheng He called at the Malacca port between 1405 and 1407). Inscription on the statue at a temple in Kampong Pulai, Gua Musang provided the historical evidence. The temple is the oldest temple in the country. Kampong Pulai was a gold mine, which had attracted many Chinese from mainland China to Kelantan. They first arrived at Kuala Besar, Pantai Cahaya Bulan here, and travelled by boat to the upriver of Sungai Kelantan as far as Gua Musang, Kelantan. The main transportation at that time was by boat along the river , Kelantan River,which was the 2nd longest in Malaya Peninsular. The ancient Malay and Chinese villages are built along the Kelantan River. Famous Chinese villages in Kelantan include Kampung Tok'kong (300 year old temple), Batu Jong, Kampung Jelatok, Kampung Temangan, Kampung Mata Ayer, Kampung Tawang, Kampung Balai, etc. There is a group of people called Peranakan Kelantan, who are Chinese who had culturally assimilated with the local Malay culture, may be with mixed blood of Chinese, Malay and Siamese. The Chinese called them Kampong Siam. They lived in village like a typical Malay, dressed like a Malay , eat like a Malay, and spoke beautiful Malay Kelantan dialect. They also have Malay name. The Malay called them Cina Kampong(Village/Rural Chinese), Cina Kelantan(Kelantan Chinese). They still preserved some of the Chinese cultural observation , and their religion is closely identified with the Siamese community. They are different from the Kelantanese Chinese from the urban area, which are called Cina Bandar(Town/Urban Chinese). Cina Kampong and Cina Bandar communicate by using Kelantan Malay dialect. There are currently only 47 Cina Kampong settlement(Rural Chinese Villages) in Kelantan. The dilemma faced by the community are the re-culturalization back to mainstream Chinese culture,inter-marriage with Cina Bandar(urban Chinese), IT communication and more opportunities for cultural interaction with other cultures. They are the living heritage of Kelantan, but will the small social group survive long? 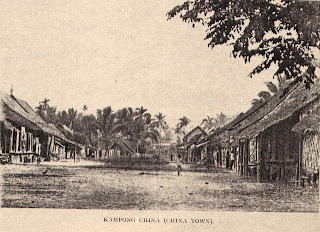 However only in 1920s, that more Chinese immigrants, especially from Guandong, Fujian, Hainan, came settled in Kelantan, mainly small shopkeepers dealing with copra, seafood, rice and other goods. As minority community , the Chinese in Kelantan (5% of Kelentan population) are having cultural harmonies with their majority community, the Malay. This is the lesson we need to learn for One Malaysia, One Malaysian. The religion harmonies in the state can be seen in Tumpat town where there is large population of Siamese and Peranakan Cina. There are many temples of Siamese architecture and statue of Buddha in the town, which is rare even in West Coast. House beside the market place, that is the reason that many cars are parked along the road, blocking the complete view of the house. Trying to take the photo of the house, but blocked by the advertisement board. At the round about closed to Jalan Gajah. The round about at the entrance of Kampong China.It is the small round about between Jalan Gajah, Jalan Pantai Cinta Berahi, Jalan Wakaf Mek Zainab. Another house opposite the entrance of the temple, across the road(Jalan Pantai Cinta Berahi). The big yellow building is another temple. A grand house at the side of the road(Jalan Pantai Cinta Berahi),which is unique with double storey and wood pillars. Is this the spot that earlist Chinese settlers landed? It was reported that a Chinese from Zhangchoa(福建漳州) arrived at the coastal beach of Bachok(萬捷海岸), Kelantan in the year 1727(清雍正五年). He took a sampan to reach a kampong near Sungei Kusial(大港頂古舍, 現在的古夏河附近的村落), Tanah Merah. He later built a temple of Mazu( 媽祖) at 6 km from Ketereh(格底里附近6英哩處, 聖春宮的前身),about 21 km from Kota Bahru. The temple is called Seng Choon Keong(聖春宮), located at Kampong Tokong( 位於竹腳南方 20公里，近刺仔腳督公村). There is a plate in the temple dated 1871(同治十年). 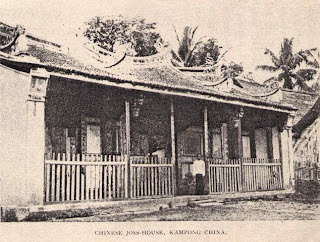 But the local Chinese found that it is difficult to travel to the temple, later Kelantan Chinese built a new temple(Cheng Hin Keong Temple or Tokong Mek, 鎮興宮) at Kampong China in 1804. The view of the Kelantan River, which downstream flow to South China Sea, the upstream can go to Gua Musang. 1. Book with the title"Peranakan Chinese of Kelantan: A Study of the Culture, Language & Communication of an Assimilated Group in Malaysia(2003), Teo Kok Seong, published by Asean Academic Pr Ltd.
4. Buddhism in a Muslim State: Theravada Practices And Religious Life in Kelantan(2006), Mohamed Yusoff Ismail, Universiti Kebangsaan Malaysia, http://eprints.ukm.my/16/1/dekan-edited.pdf( for knowledge on religion aspect of Kelantan Chinese(both Cina Kampong and Cina Bandar, and the Siamese).